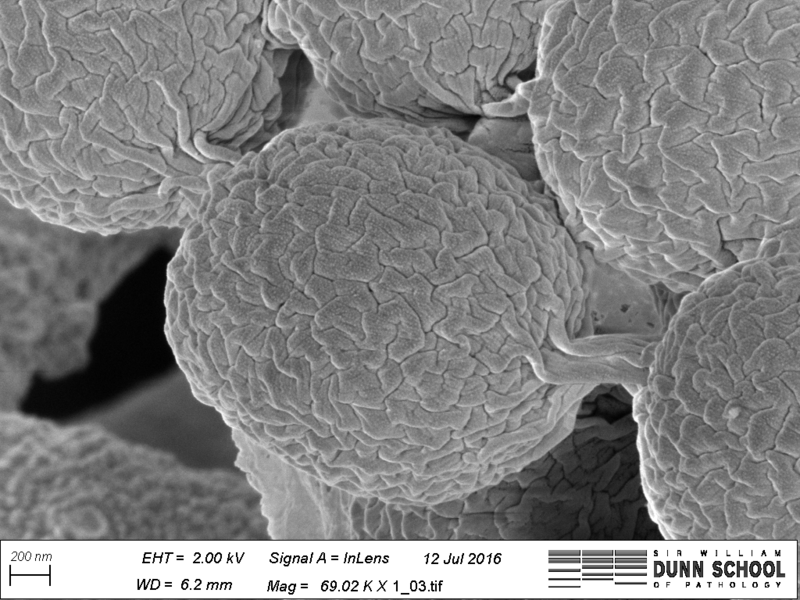 The Zeiss Sigma 300 Field Emission Gun Scanning Electron Microscope (FEG-SEM) enables high resolution imaging of biological and biomaterial samples, providing surface structural, topographical information, in addition to compositional contrast. 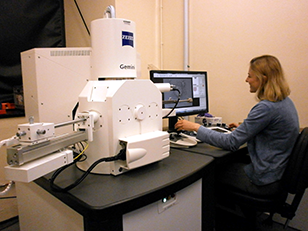 The Sigma 300 offers a range of features for easy acquisition of high quality SEM micrographs. Beam reactive samples can be imaged at low accelerating voltage without sacrificing resolution. There are five detectors available: two secondary electron detectors, a backscattered electron detector for elemental contrast (ie; of immunogold particles on surfaces), a Scanning Transmission Electron Microscopy (STEM) detector for screening up to 12 TEM grids at a time and an Electron Dispersive X-ray Spectroscopy (EDS) detector for characterising the chemical composition of samples. Carr, K.E., 1971. 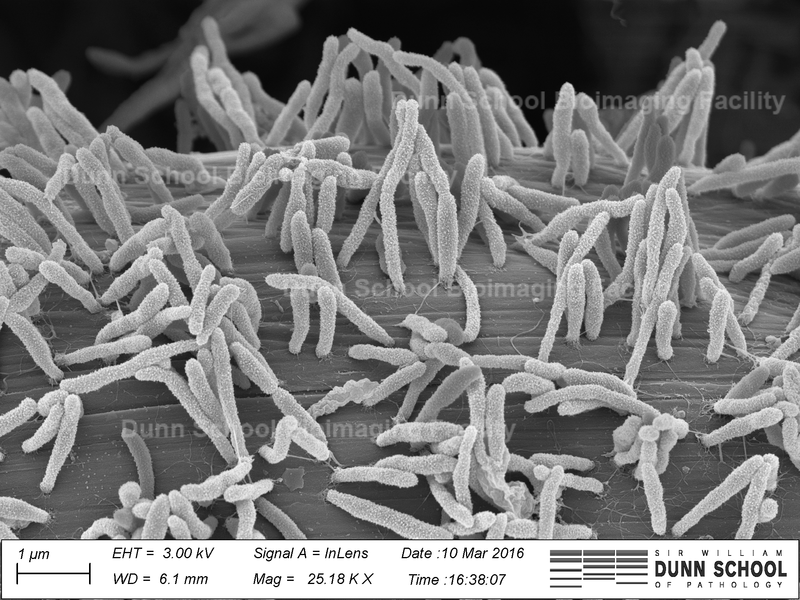 Applications of scanning electron microscopy in biology. International review of cytology, 30, pp.183-255. Schatten, H. and Pawley, J.B. eds., 2008. Biological low-voltage scanning electron microscopy. New York: Springer. Bozzola, J.J. and Russell, L.D., 1999. Electron microscopy: principles and techniques for biologists. Jones & Bartlett Learning. Hayat, M.A., 1978. Introduction to biological scanning electron microscopy. University Park Press. Scotuzzi, M., Kuipers, J., Wensveen, D.I., De Boer, P., Hoogenboom, J.P. and Giepmans, B.N., 2017. Multi-color electron microscopy by element-guided identification of cells, organelles and molecules. Scientific Reports, 7, p.45970. Baker, Y.R., Chen, J., Brown, J., El-Sagheer, A.H., Wiseman, P., Johnson, E., Goddard, P. and Brown, T., 2018. Preparation and characterization of manganese, cobalt and zinc DNA nanoflowers with tuneable morphology, DNA content and size. Nucleic acids research, 46(15), pp.7495-7505. Costello, I., Nowotschin, S., Sun, X., Mould, A.W., Hadjantonakis, A.K., Bikoff, E.K. and Robertson, E.J., 2015. Lhx1 functions together with Otx2, Foxa2, and Ldb1 to govern anterior mesendoderm, node, and midline development. Genes & Development, 29(20), pp.2108-2122. Wörmann, M.E., Horien, C.L., Johnson, E., Liu, G., Aho, E., Tang, C.M. and Exley, R.M., 2016. Neisseria cinerea isolates can adhere to human epithelial cells by type IV pilus-independent mechanisms. Microbiology, 162(3), pp.487-502. 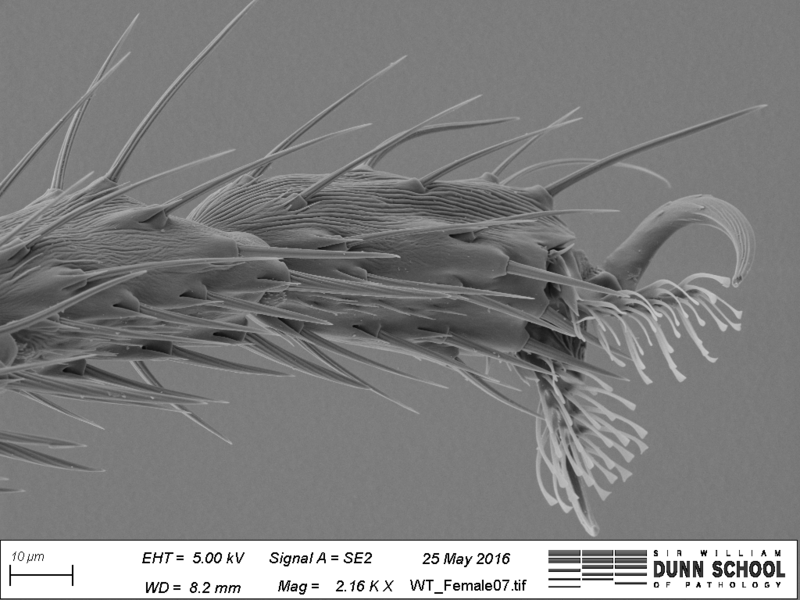 If you would like to find out more about this microscope or would like to discuss SEM imaging options for your research, please contact Errin Johnson.